Our core tenet at Assured Automation is to provide excellent customer service by providing quality products that are delivered on time. Since quality is an integral part of our strategy, Assured Automation commits to constantly monitoring, auditing and updating our processes and procedures to comply with requirements by using efficient processes and continually improving of our Quality Management System. To ensure that we achieve these goals we have become ISO 9001:2015 certified. The ISO 9001:2015 standard provides guidance and tools for companies and organizations who want to ensure that their products and services consistently meet customer’s requirements with quality being consistently improved. This standard sets out the criteria for a quality management system used by many organization, large and small. In fact, there are over one million companies and organizations in over 170 countries certified to ISO 9001. Using ISO 9001:2015 helps ensure that customers get consistent, high quality products and services, which in turn brings many business benefits. 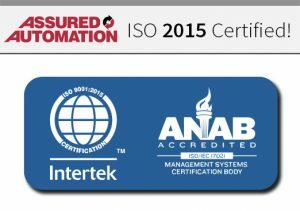 Assured Automation has been ISO 9001:2008 certified since 2010 and committed to achieving the upgraded 9001:2015 standard in 2017. These standardizations focus on putting customers first. Our goal is to consistently meet customer needs to enhance their satisfaction through thoughtfully defined objectives that force us to work more efficiently while identifying areas that need improvement. We are audited on a yearly basis by a third-party certification to keep our ISO status up to date. We employ a highly experienced team that is totally focused on making our customers’ experience easy and enjoyable. We have developed unmatched expertise in the valve automation field making us an invaluable resource. In addition to our standard offering of stocked components which are available as part of our Quick-Ship program, we also provide special order and custom solutions for unique applications. We also offer a unique interactive online valve configurator which allows customers to quickly specify a valve assembly for quote or purchase. That’s how We Make Valve Automation Easy for our customers! We are proud to announce our ISO 9001:2015 Certification. We strive to provide excellent customer service by providing quality products, delivered on time. This entry was posted in Latest News and tagged ISO 9001:2015. Bookmark the permalink.